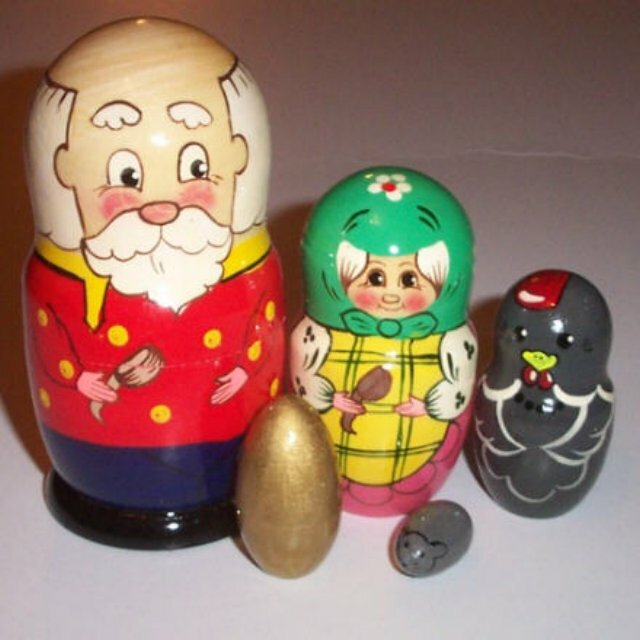 This set depicts the Russian children's fairy-tale "Kurochka Riaba" ("The Speckled Hen"). In the story, an old man and his wife have a spotted hen that each day lays an egg for them, but one day the hen lays a special golden egg. The old man, and then the old woman try to break the egg, but could not. Finally a mouse goes by and with a wag of its tail the egg rolls, falls and breaks. In the end they learn the value of the ordinary eggs. There is a small dark spot in the wood at the back of Grandpa's head, but this small spot serves to give these handmade dolls character.